Our overnight camp serves 7 to 16-year-old campers. We feature traditional camp activities such as archery, arts & crafts, horseback riding, swimming, outdoor survival, music, mountain biking and more! Campers are able to create their own program and pick the activities that they would like to try with our “free choice” format. Each Wednesday during the afternoon activity sessions, we offer a variety of new activities to mix things up and allow our campers to try something new such as rock wall climbing, giant slip n’ slide, “spa” day or water rockets. As part of our resident camp, campers participate in a special evening program. Programs may include: Camp Fires, Dances, Karaoke Night, Skit Night, Bingo, Casino Night, Color Wars, Night Hikes, Sleep Outs, Moonlight Pool Parties and much more! 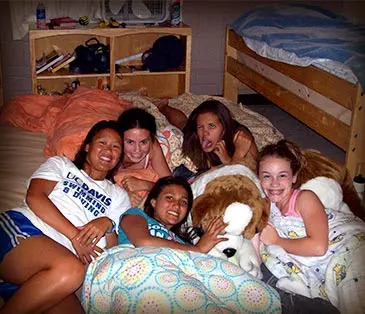 Campers stay in comfortable, college style dorm rooms with approximately 2-8 other campers. Both the boys’ and girls’ dormitories feature a common room, game room with ping-pong and pool tables and an outdoor patio area. Large, modern bathrooms with private showers are in each hall as well as washers and dryers. Counselors are also available to help out campers doing laundry for the first time! All of our nutritious meals are prepared by the Woodside Priory School’s year-round chef and professional food service team. Breakfast, lunch, and dinner consist of hot meal options such as: Breakfast – omelets, French toast, pancakes, and waffles. Lunch – ravioli with cream sauce, chicken ciabatta, roast beef, lasagna, and fajitas. Dinner – grilled salmon, spare ribs, chicken marsala, grilled steak, stir-fry and roasted turkey. In addition, each meal is served alongside a cereal, fresh fruit, salad, sandwich, pasta and baked potato bars. Please click on our Weekly Menu for the meals that are planned for this summer. Mountain Camp Woodside is centrally located 45 minutes south of San Francisco near Palo Alto, the Silicon Valley, and Stanford University. Nestled in a quiet valley near the Windy Hill Preserve, our camp has the feel of remoteness while being convenient to the entire Bay Area. Our Resident Camp staff ratio is typically 3 to 1 and we recruit our counselors from all over the world. Click here for a link to our Resident Camp Dates & Rates. Please click here for a link to our “First Time Camper Orientation” webinar. If you have a friend who might be interested in learning more about Mountain Camp Woodside, please click on our Refer-A-Friend form and we will send them information right away. My daughter Romy is 8 years old and for her to want to attend the overnight camp brought joy to my heart. The counselors at Mountain Camp bring joy, love and more energy than the kids. Romy says ”the food is great.” Camp was a success. - David M.